Beautiful farmhouse, spacious, very elegant, well equipped and renovated with prestigious finishes. The house enjoys a unique and priceless panorama, with a view that sweeps over the whole valley: from the nearby city of Pistoia to the point of seeing Florence in the clearest days. The complex has a beautiful, well-kept and very spacious garden characterized by tall trees, flowers and ornamental plants; The property is also characterized by its typical Tuscan terrace fields dotted with olive trees, various fruit trees, a vegetable garden and a wooded area. The house is located in a hilly area (about 200 m. S.l.) in the countryside, but at the same time only 5 km from the center of Pistoia and 3 km from the motorway exit. This strategic position allows you to reach in about 30 minutes both the city of Florence and that of Lucca and is only 10 minutes from the historic center of Pistoia (named Italian capital of culture for the year 2017) and 20 minutes from Prato. Nearby there are 2 swimming pools (one open only in summer, the other all year round both outside and inside), an excellent restaurant and a beautiful wooded area that offers challenging routes for both trekking and mountain biking enthusiasts; about thirty minutes there are riding stables and a beautiful golf course (Le Pavoniere Golf & Country Club). The house of 240 m2, on 2 levels, has 3 bedrooms, 2 bathrooms, 1 living room with dining area and 1 large room with adjoining loft used as a double bedroom, a kitchen, a pantry and a small courtyard to use as a laundry area. Both the living room and the living room have two perfectly functional fireplaces. The rooms on the upper floor have air conditioning, the other 2 double bedrooms are equipped with high quality three-speed fans; all doors and fixtures see screens installed. Outside, overlooking the garden, we find a beautiful pergola equipped to enjoy pleasant outdoor dinners and at the same time admire immersed in nature our incomparable breathtaking view. Beautiful Villa inside and out with a breathtaking view of Pistoia! Our host Gabriele was great! I would highly recommend this Villa. Very clean and well taken care of. There is plenty of room with cozy furniture. My daughter and I enjoyed sitting on the front patio table watching the beautiful sunrise and sunsets. Our host Gabriele gave us a gift basket full of pasta and wine to enjoy our first dinner there. He went out of his way and was very kind to assist us with our transportation needs in addition to being available for any questions we had. Gabriele made our stay the best! I would recommend renting a car to enjoy the town of Pistoia and nearby cities. You can also take a train to Pistoia and arrange for a taxi to get to the Villa. Truly the best accommodations at a great price. Thank you very much for your feed back! It has been a great pleasure to host you and your daughter at my property and of course you will be more than welcome if you will plan to come again. Thank you very much Alastair, it has been a great pleasure to host you and your family; I hope to see you soon! Die Anfahrt zu diesem Ferienhaus war bis auf den letzten Kilometer sehr unkompliziert. Was aber nur unserem Navigationsgerät zuzuschreiben war. Ein Anruf beim Vermieter brachte uns schnell wieder auf den richtigen Weg. Das Haus liegt in einem wunderschönen, mit Olivenbäumen bewachsenen Hang etwas abseits der Stadt Pistoia. Das letzte Stück der Zufahrt war zu beginn etwas schwierig, da es sehr kurvig und leider auch nicht mehr Asphaltiert ist, wenn man jedoch oben ankommt und durch das sich automatisch öffnende Tor fährt wir man dafür mit einem Ausblich belohnt, der seines Gleichen sucht. Diesen Ausblick konnten wir nun 7 Abende lang von einer wunderschön angelegten und sehr gepflegten Terrasse aus genießen können. Der Rundgang im Haus mit dem Vermieter war sehr informativ. Er hat alles sehr gut erklärt und war auf alle Fragen (auch bezüglich der Umgebung, Unternehmungen etc.) sehr gut vorbereitet. Was ich persönlich sehr zuvorkommend fand war, dass er uns bereits mit Essen für den ersten Abend und den nächsten Morgen ausgestattet hat. So konnten wir bereits am ersten Abend (Sonntag-Abend) die wunderbare Aussicht bei eine schönen Flasch Chianti genießen. Wer gerne kocht oder grillt ist hier bestens aufgehoben, da das Haus zum Grillen und Kochen bestens ausgestattet ist. Fehlt etwas, ober bestand ein Problem genügte ein Anruf oder eine Nachricht an den Vermieter, der in diesem Fall direkt für Abhilfe gesorgt hat. Zu dem Ferienhaus kann ich nur sagen, dass die hier gezeigten Fotos nicht wirklich zeigen, wie groß und schön das Haus eigentlich ist. Die Zimmer sind alle geschmackvoll und zweckmäßig eingerichtet und es ist alles sehr sauber. Sehr gut war auch die Tatsache, dass in den Schlafzimmern eine Klimaanlage installiert ist, so dass man trotz der hohen Temperaturen eine angenehme Nacht verbringen konnte. Die Lage des Hauses ist nahezu perfekt. Florenz läßt sich bequem mit dem Zug erreichen. Die Parkplätze im nahegelegenen Pistoia sind kostenlos und eine Zugfahrt nach Florenz ist sehr günstig. Alle weiteren Ziele, wie z.B. Lucca, Pisa, Sienna... sind sehr gut mit dem Auto zu erreichen, da die entsprechende Autbahnauffahrt nur max. 5 Minuten vom Haus entfernt liegt (Nein, den entsprechenden Verkehr hört man nicht ;-)). Die Abende kann man von dort aus sehr vielfältig ausklingen lassen, ein Besuch im nahe gelegenen Pistoia lohnt sich immer und das nächste Restaurant ist auch nur 15 Fußminuten entfernt. Ich kann dieses Haus nur empfehlen. 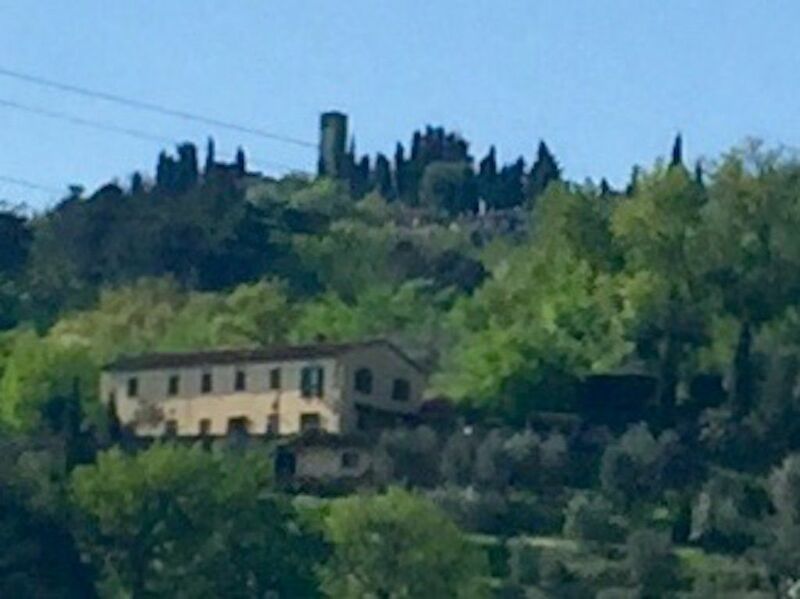 The property enjoys an incomparable view over the whole valley: from the nearby Pistoia to see Florence in the clearest days. The location is 10 minutes from the historic center of Pistoia and is in a strategic area to reach in a short time (or by own means or by train) the nearby Florence, Lucca, Prato and Pisa. Within a 2 km radius there are 2 public swimming pools, 3 tennis courts, a wooded area for trekking and / or mountain biking. 2 supermarkets, 1 shopping center. At 15 minutes the prestigious Golf & Country Club le Pavoniere and numerous typical restaurants, both simpler and of excellent quality.